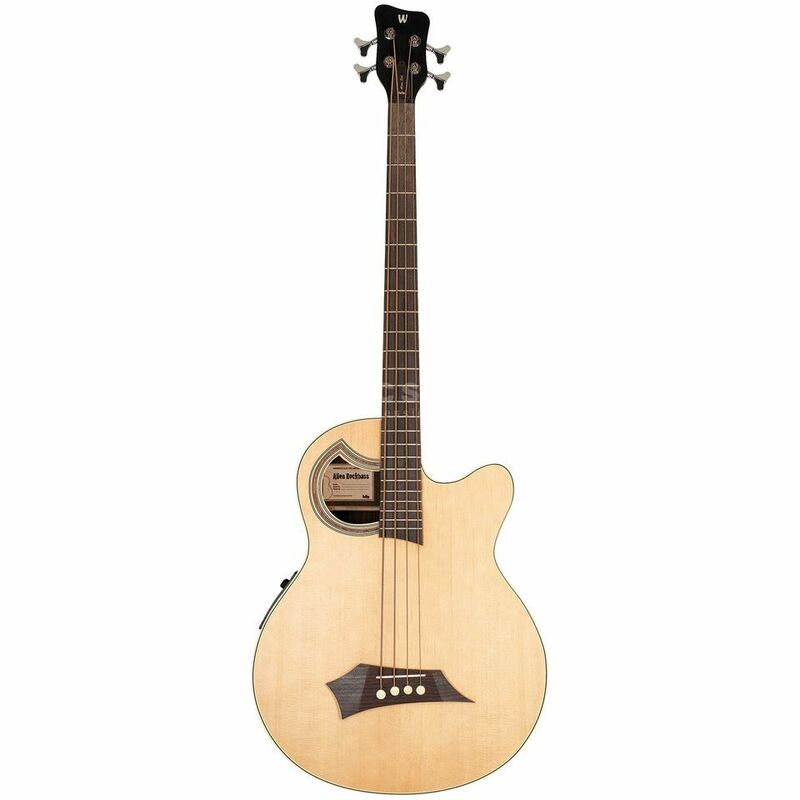 Warwick Rockbass Alien Standard 4-String Acoustic Bass Guitar with Spruce Top, Agathis Back And Sides, Mahogany Neck With Rosewood Fingerboard, Fishman Electronics, Natural High Polish. The Warwick Rockbass Alien fills the gap between the double bass and the electric bass. It provides a wealth of new opportunities for expression and adds an extra dimension to the musician's domain. Unusual styling in the convenient cutaway, the off-center asymmetric soundhole, add to the uniqueness of the overall shape and warm tones of this acoustic model. The top and body are both laminated for increased durability in stage use. Equipped with the Fishman Prefix Plus acoustic guitar system, it provides a variable notch filter, shelving bass & treble, semi-parametric contour and brilliance controls for precise tone shaping. There is also a phase reversal switch and low battery indicator. Even without amplification, the basic character is evident; a growling tone across the instrument's full range with a big bottom. Unlike all other Warwick basses, the Alien is not manufactured in Germany. Built in Vietnam by a well-known acoustic builder to Warwick's exacting specifications, using technology and components supplied by Warwick. They were chosen for their proven acoustic expertise as well as meeting the demanding standards of Warwick. Warwick Red Strings Bronze Acoustic Bass strings: 4-string: .045" – .105", 5-string: .045" – .135"